These are probably my favorite squares. They are called Midnight Mints and they are the minty equivalent of the well-known Nanaimo Bar. 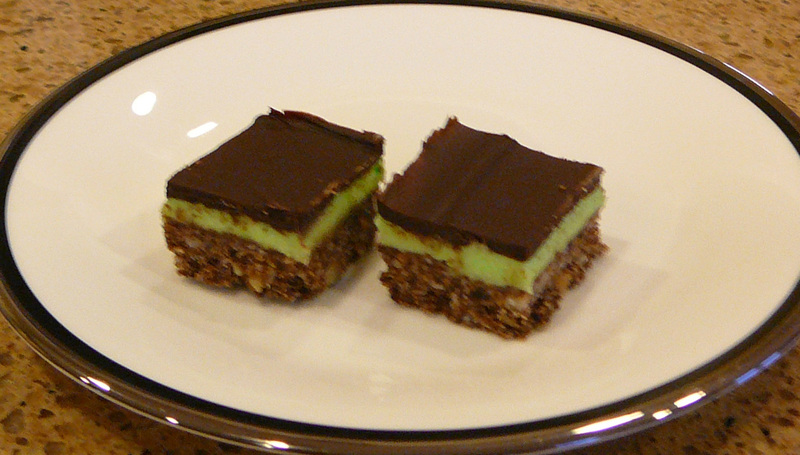 I love how mint and chocolate go together. Today I added a little more butter to the chocolate for the topping since it was looking a little too thick to spread - what a wonderful idea! It was totally spreadable and easier to cut than usual. I had frozen the bottom two layers for a few minutes before adding the chocolate top, which also helped spread the chocolate without getting the green mixing into it. I was very pleased with how these turned out. The ones in the photo are actually the "rejects" from the bunch that I froze for Easter dessert! This recipe comes from the Company's Coming 150 Delicious Squares Cookbook again. It is on page 13. The crust is a hearty mixture of coconut, walnuts, graham cracker crumbs and cocoa, along with an egg, some butter and some sugar. It is not too time-consuming to make either, since the bottom gets cooked a little, but there is no baking involved. I'm sure my Easter company will love them! What are your favorite squares? I'm planning to have a selection for Easter and all I can think of is chocolate, chocolate and more chocolate!